We carry only the finest cuts from our Chairman's Reserve Premium Black Angus Beef. 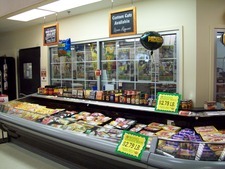 We offer a full line of gourmet stuffed items great for time saving meals. Stop by for all your game time snacks or meals from our glazed, breaded or seasoned wings, to our own seasoned or glazed pork or beef ribs. Our friendly staff is here to help with anything from custom cuts to all our cooking secret recipes. Just ask, we are here to help.